Its a Mobile, Tablet and TV based Guest Experience & Marketing App for Hotels. The hotel app developed using this solution now can run on Android based tablets and smartphones as well as the in-room TVs, along with iPads and iPhones. “Most Innovative Product” Award* Winner, Blynk Systems, today announced launch of the Android version of their revolutionary Mobile App for Hotels ‘Blynk iHotel’. It’s a Mobile, Tablet and TV based Guest Experience & Marketing App for Hotels. The hotel app developed using this solution now can run on Android based tablets and smartphones as well as the in-room TVs, along with iPads and iPhones. Android devices are ever-growing in popularity and acceptance. The cost of devices starts from as low as $100. 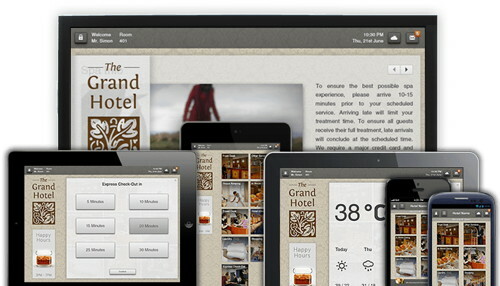 For Hotels, this means that their App can now run on a wide range of devices. Hotels have a choice of either to install Android tablets with App in their room, or install the App on their Guests’ devices. With the Android version, Blynk has become one of the first few companies to launch hotel apps which works on TV. This is achieved by installing an Android TV Dongle and a wireless mouse. Besides hotel app, Android TV can be setup to run popular apps on the existing TVs, which helps hotels offer a revolutionary new interactive experience with minimal hardware cost and installation. About Blynk iHotel: It is a hospitality solution for hotels. It empowers guests to fully utilize hotel services. Hotels can provide a better guest experience and increase revenue by cross selling and up selling services. It is the only way hotels can be directly connected with their guests. Your hotel app can be download from the App Store either on guests’ devices or on devices provided by the hotel. Guests can browse through all of the hotel’s services and place orders and requests directly from the app. They can also place requests when they are outside the hotel. They can get notifications and updates on new offers and events at the hotel. * “Most Innovative Product” awarded by Travel & Tourism Fair (TTF) Ahmedabad and Mumbai, 2012.